U.S. Senator Sherrod Brown (D-Ohio) has kicked off a tour of key presidential states. Ohio’s senior U.S. Senator has launched a tour of key presidential primary and caucus states, but says he hasn’t yet decided if he’ll seek the Democratic nomination in 2020. 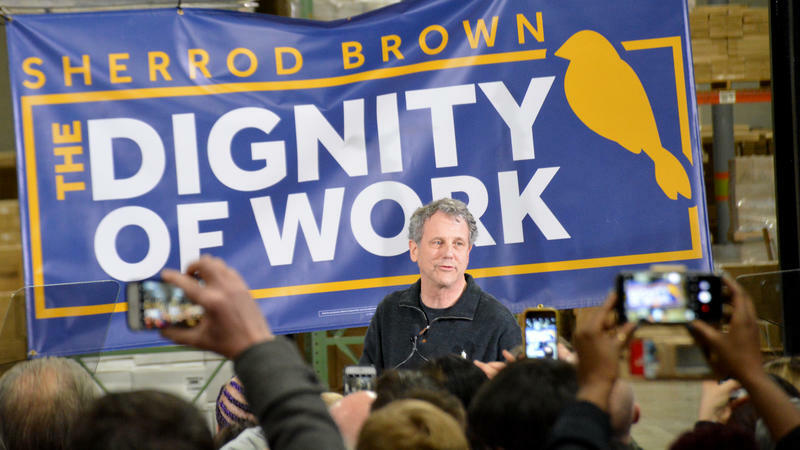 Some campaign experts in Ohio shared their thoughts on Sherrod Brown’s “Dignity of Work” tour. Former Democratic National Committee chair David Wilhelm managed President Bill Clinton’s 1992 campaign, and likes Brown’s approach. “I think he has the sharpest message of any potential candidate so far,” Wilhelm said. Wilhelm said donors are looking at Brown, and while Brown isn’t the most liberal candidate in the field, Wilhelm said he has a clear pathway in the party. “I think what's really intriguing about a potential Sherrod Brown candidacy is that he's a bridge. He's a bridge between the left of the party and the center of the party. He's a bridge between the past of the party and the future of the party,” Wilhelm said. “I don't think anybody can really challenge Sherrod Brown when it comes to his progressive values, his progressive record. He'll do quite fine. “But I think if you're looking for somebody who can win in the Midwest, who out there fits that bill with quite the clarity that Sherrod Brown does? Not many,” Wilhelm said. Democratic strategist Jerry Austin ran Jesse Jackson’s 1988 presidential campaign, and has known Brown for more than 40 years. And Austin said Brown has an appeal to people throughout the party. On the other side of the political fence sits Matt Borges, who was the chair of the Ohio Republican Party when Gov. John Kasich won the state’s presidential primary in 2016. Borges has been an outspoken critic of President Trump. He said Brown could present a good option for Democrats and even frustrated Republicans, though he admitted Brown is not his brand of politics. “I don't want to see us move in a different direction, but I do think that we need a candidate for president who maybe sets a little bit of a different tone and brings back some of the respect and dignity to the office,” Borges said. And Borges said anyone who counts Brown completely out does so at their own peril. Brown has said he’ll make a decision on whether he’ll run after his tour through Iowa, New Hampshire, Nevada and South Carolina concludes.